Create meaningful memories, have epic adventures and go where the locals go — anything is possible in Biloxi. But first, let us offer you the essentials about your next vacation destination! This city lies 150 miles (241 kilometers) southeast of Jackson, the state capital of Mississippi, and 12 miles (19 kilometers) east of Gulfport. At the most recent count, the population of this area of Mississippi Gulf Coast was 44,000. 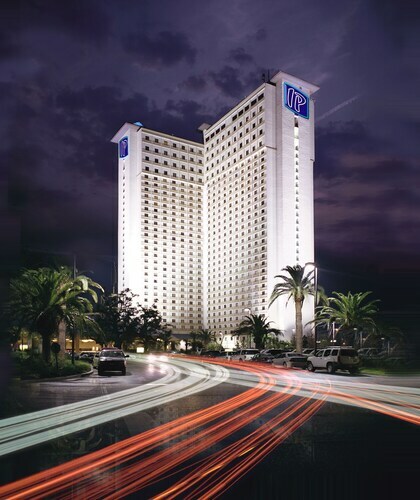 Get the lowest price on your trip to Biloxi by combining your airfare and accommodation bookings. You can also pick from more than 400 airlines and 665,000 properties. Our Customer 1st Guarantee gives you the security of 24/7 personal assistance on everything from airfares and accommodations to car rentals and activities. If you happen to discover a cheaper price on another website, we'll refund the difference^. Adjustments to airfare and accommodation bookings never incur any hidden charges from us. And so long as you get in quick, most accommodations won't charge you a fee either^. Whether you're in the mood to splash some cash on accommodations or you simply want someplace to use as a base, you'll find what you're searching for in Biloxi. With 36 properties on Travelocity, you'll have no issues catching those Zs after a big day of unforgettable adventures. If you're the sort of traveler with a taste for soft, silky sheets, look up the Beau Rivage (875 Beach Blvd) or the Golden Nugget Biloxi (151 Beach Blvd). More of a cost-conscious traveler? The Econo Lodge Biloxi Beach North (1776 Beach Blvd) and the Regency Inn & Suites Biloxi (11969 Bobby Eleuterus Blvd) may be the properties for you. Where do you fly into for Biloxi? 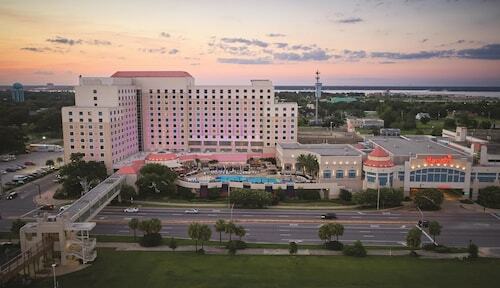 Get ready for some unforgettable experiences in Biloxi. Once you've wandered out of Gulfport - Biloxi International Airport (GPT), the middle of town will be only 11 miles (18 kilometers) away. Can I rent a car in Biloxi? Thinking about taking a road trip around Biloxi? A rental car will no doubt be handy here. Browse through the options on Travelocity, make a selection and you'll be on the road in no time! Getting in by plane? Dollar Rent A Car at Gulfport - Biloxi International Airport is the best place to go to after you hit the tarmac. If you want to rent a ride in Biloxi, you'll need to travel to one of the outer neighborhoods. Make your way to D'Iberville, where you will find Enterprise at 11044 Auto Mall Parkway. Biloxi Lighthouse and the Beauvoir-The Jefferson Davis Home and Presidential Library are some fabulous places that all serious sightseers should make time to see. Plan a route and spend a few hours exploring each one. There is something bewitching about the heaving swell of the sea. Unroll a picnic blanket, stretch out and admire the fluctuating moods of the ocean at Biloxi Beach. Want some more options? If you want to observe a military facility, check out Keesler Air Force Base. Here, you'll be able to fully appreciate the capacity of local defence capabilities. And there's more. Lavish decor, flashing lights and confident croupiers are just a few of the things you'll come across at Boomtown Casino Biloxi. 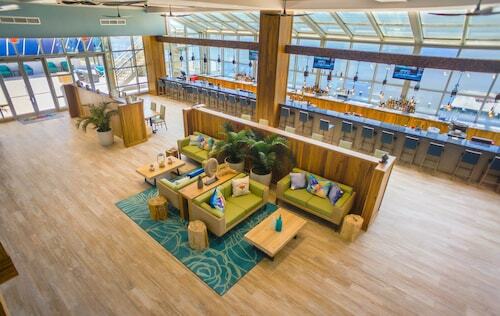 Meander around the poker tables or simply sit back with a cocktail and revel in the atmosphere. Whether you want your next adventure to be heart-stopping and electrifying or more laid-back and calm, one thing's for sure — you'll have plenty of stories to dine out on when you get home! It doesn't matter what awesome adventures you've organized for Biloxi, a Dining at Hard Rock Cafe Biloxi with Priority Seating should be towards the top of your itinerary! Biloxi has plenty of things to see and do, but if you'd like to explore further afoot, you're in luck! You've got internationally celebrated attractions just a stone's throw from here! Travelers from near and far flock to the USS Alabama Battleship Memorial Park. You can reach it easily from Mobile, which is 55 miles (89 kilometers) away. Overlooking the waters of Mississippi's Back Bay, this casino hotel is 1 mile from the beach, 16 miles from the Gulfport Biloxi airport, and 54 miles from Mobile. 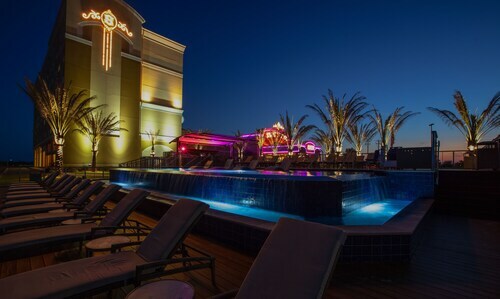 Set on the Mississippi coast, this 29-story casino hotel is 200 yards from beach access, five blocks from the Biloxi Lighthouse, 60 miles from Mobile, and 85 miles from New Orleans and the Superdome. Situated near the bay, this spa hotel is 0.2 mi (0.4 km) from Maritime and Seafood Industry Museum and within 3 mi (5 km) of Biloxi Beach and Front Beach. Boomtown Casino Biloxi and Keesler Air Force Base are also within 3 mi (5 km). Located in the heart of Biloxi, this spa resort is 0.2 mi (0.4 km) from Point Cadet Marina and within 3 mi (5 km) of Biloxi Beach and Front Beach. Boomtown Casino Biloxi and Keesler Air Force Base are also within 3 mi (5 km). 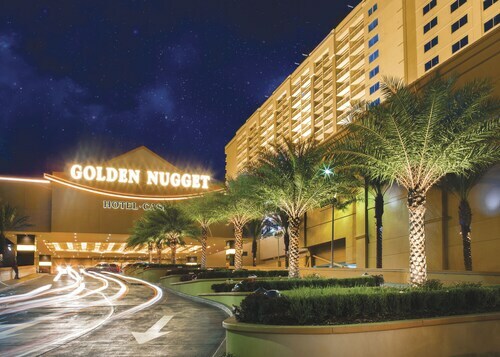 The glam Golden Nugget Biloxi is on the Gulf of Mexico, a 5-minute drive from downtown Biloxi. In addition to the resort's casino, gaming-loving guests can drive 5 minutes to Harrah's Gulf Coast or to the Hard Rock and Beau Rivage. A man-made, white-sand beach stretches from Biloxi to Gulfport. Situated near the beach, this hotel is within a 10-minute walk of Biloxi Beach, Biloxi Visitors Center, and Biloxi Lighthouse. Keesler Air Force Base and Cathedral of the Nativity of the Blessed Virgin Mary are also within 1 mi (2 km). This Bay St Louis hotel is on the beach, 2 mi (3.3 km) from Buccaneer State Park, and within 9 mi (15 km) of Saint Stanislaus College and Bay St. Louis Little Theater. Alice Moseley Folk Art and Antique Museum is 8.2 mi (13.2 km) away.